The following afternoon, Sam noticed the water hose was bulging abnormally. Before anything could be done to fix it, the hose burst, shooting an impressive geyser of water into the air. To his credit, Sam did install a water pressure regulator; unfortunately, he didn’t install it correctly. 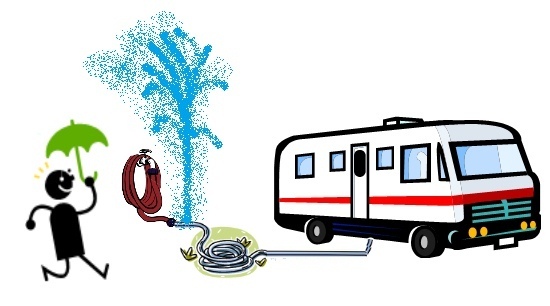 Instead of attaching it directly to the water source, he attached it to the RV, leaving the hose unprotected from the high pressure of the water source. Luckily for Sam, John had a spare water hose. Water pressure is dependent upon how far the water must flow to get to the source. Often in RV parks the water tank is positioned uphill or far away from the park; therefore, the pressure will be higher than normal. Because this is the case, the use of a water pressure regulator keeps your water lines and pipes from bursting. When choosing your regulator, keep in mind that plumbing is rated in psi, and the actual RV piping may be rated at 125 psi. Although this is true, the system as a whole is rated to operate at a lower psi. A typical psi is somewhere around 40-55 psi even though most RV piping is tested at 100 psi. Some regulators have a gauge that shows the level of pressure running through the regulator, but this is not your only option. You can also choose a simple regulator attachment to mount on your RV water source. Whichever regulator you decide to go with, be sure to follow those directions and hook it up correctly so that the only geysers you witness are in Yellowstone and not spouting from your RV.